I am the Head of School in School of Mathematics and Statistics. DIF analysis is commonly used in large-scale educational tests and survey studies. DIF analysis helps reveal whether the test or survey is fair, or whether it is systematically biased against certain groups of test-takers, such as women or certain underprivileged groups. The Liu-Agresti estimator (Liu and Agresti, 1996, DOI: 10.2307/2532838) is widely used when performance is scored according to the degrees of proficiency, rather then correct or incorrect. The Liu-Agresti method can be implemented by packages DIFAS 5.0, WINSTEPS (DIF statistics), etc. The BUC method (Mukherjee, Ahn, Liu, Rathouz, and Sanchez, 2008, DOI: 10.1002/sim.3325) is named by Baetschmann et al. (2015). For a longitudinal study, researchers are often concerned about the unobserved heterogeneity. The BUC method provides a simple way to obtain consistent fixed effect estimators for an ordered logit model to control the unobserved heterogeneity. The BUC method was originally proposed for biomedical case-control data. Gunasekara, Carter, Liu, , Richardson, and Blakely (2012) first used the method for a longitudinal data. A multiple response variable is a categorical variable for which respondents can select any number of outcome categories. Such data arise often in a survey. For example, a question might be ``which of the following learning methods have you used'' and the respondents could tick all items that apply. We (DOI: 10.1111/j.0006-341X.1999.00936.x, DOI: 10.1177/0049124101029004001, DOI: 10.1002/bimj.200710395, DOI: 10.1111/insr.12015) used maximum-likelihood or quasi-likelihood approaches to analyse such data. Some of the methods can be implemented using packages SPSS, R (MRCV), etc. Dimension reduction for mixed type multivariate data (PIs: Ivy Liu and Richard Arnold; AIs: Shirley Pledger and Daniel Fernandez) Marsden Fund March 2017 - March 2020. Feature Clustering for Various Types of Variables (PI: Ivy Liu; AIs: Richard Arnold and Bing Xue ) University Research Fund (URF) Jan - Dec 2016. Cluster analysis for ordinal categorical data (PIs: Richard Arnold and Ivy Liu; AI: Shirley Pledger) Marsden Fund March 2013 - March 2016. Cluster analysis for ordinal data University Research Fund (URF) Jan - Dec 2011. Longitudinal data analysis for ordinal responses University Research Fund (URF) Jan - Dec 2010. Ordinal data challenges for medical sciences University Research Fund (URF) Jan - Dec 2009. Analysis of matched case-control study using ordinal models University Research Fund (URF) 2007-2008. Graphical diagnostic methods for ordinal response models Faculty Research Grant (Science Faculty) May - Dec 2008. Modelling repeated multiple responses data University Research Fund (URF) Jan - Dec 2004. Contact me if you want to do a PhD in my research areas and want to get a scholarship. My research grants can support several research assistants. Succesful applicants will be paid. Applicants are expected to have a B+/A- or above in STAT or MATH papers, and have strong programming skills in R.
If you want to gain work experience, please contact me. Suesse, T. and Liu, I. (2018). Mantel-Haenszel estimators of a common odds ratio for multiple response data. Statistical Methods & Applications, to appear. Fernandez, D., Arnold, R., Pledger, S., Liu, I., and Costilla, R. (2018). Finite mixture biclustering of discrete type multivariate data. Advances in Data Analysis and Classification, to appear. Berman, E., Chen, D. Y., Wang, X., and Liu, I. (2017). Executive entrepreneurship in national departments. Administration & Society, DOI: 10.1177/0095399717701523. Fernandez, D. and Liu, I. (2016). A goodness-of-fit test for the ordered stereotype model. Statistics in Medicine, DOI: 10.1002/sim.7002. Preedalikit, K., Liu, I., Hirose, Y. Sibanda, N. and Fernandez, D. (2016). Joint modeling of survival and longitudinal ordered data using a semiparametric approach. Australian & New Zealand Journal of Statistics 58, 153--172, DOI: 10.1111/anzs.12153. Matechou, E., Liu, I., Fernandez, D., Farias, M., and Gjelsvik, B. (2016). Biclustering models for two-mode ordinal data, Psychometrika 81:611, DOI:10.1007/s11336-016-9503-3. Liu, I. (2016). Analysis of Categorical Data with R by BILDER, C. R. and LOUGHIN, T. M. (Book Reviews). Australian and New Zealand Journal of Statistics, 58, 141-142. Xue, B., Lane, M., Liu, I., and Zhang, M. (2016). Dimension Reduction in Classification using Particle Swarm Optimisation and Statistical Variable Grouping Information. IEEE Symposium Series on Computational Intelligence (IEEE SSCI 2016). Athens, Greece, December 6-9, 2016 pp (to appear). Nguyen, H. B., Xue, B., Liu, I., Andreae, P., and Zhang, M. (2016). New mechanism for archive maintenance in PSO-based multi-objective feature selection. Soft Computing 20, 3927--3946 DOI 10.1007/s00500-016-2128-8. Nguyen, H. B., Xue, B., Liu, I., Andreae, P., and Zhang, M. (2015). Gaussian Transformation based Representation in Particle Swarm Optimisation for Feature Selection. Proceedings of the 18th European Conference on the Applications of Evolutionary Computation (EuroApplications 2015). Lecture Notes in Computer Science. Vol. 9028. Copenhagen, Denmark. 8-10 April 2015. pp. 541-553. (Nominated as Best Paper). Nguyen, H. B., Xue, B., Liu, I., and Zhang, M. (2014). PSO and Statistical Clustering for Feature Selection: A New Representation. In Simulated Evolution and Learning (pp. 569-581). Springer International Publishing. Arnold, R., Chukova, S., Hayakawa, Y. and Liu, I. (2014). Joint Modelling of Failure Times and Severities Using fuzzy Clustering. Proceedings of the Asia-Pacific International Workshop in Advanced Reliability Modelling, Sapporo, Japan, 21-23 August. 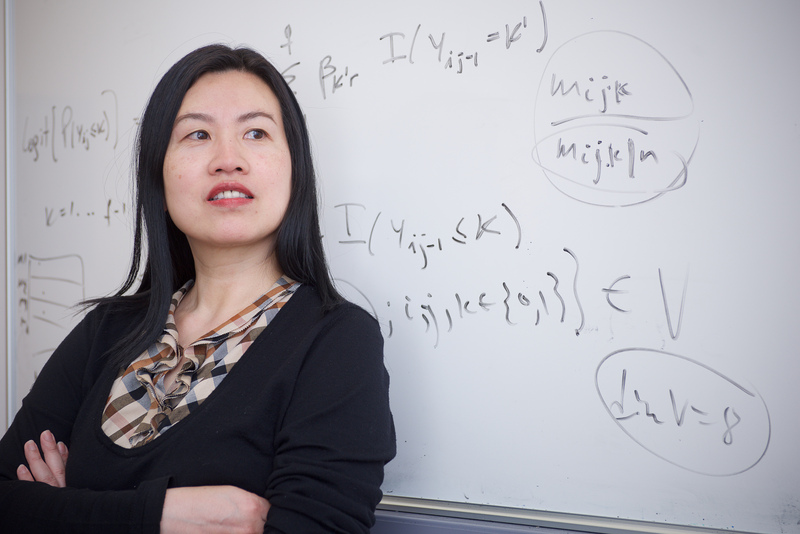 Nguyen, H. B., Xue, B., Liu, I., and Zhang, M. (2014, July). Filter Based Backward Elimination in Wrapper Based PSO for Feature Selection in Classification. In Evolutionary Computation (CEC), 2014 IEEE Congress on (pp. 3111-3118). IEEE. Lane, M. C., Xue, B., Liu, I., and Zhang, M. (2014). Gaussian Based Particle Swarm Optimisation and Statistical Clustering for Feature Selection. In Evolutionary Computation in Combinatorial Optimisation (pp. 133-144). Springer Berlin Heidelberg. Suesse, T. and Liu, I. (2013). Modelling strategies for repeated multiple-response data. International Statistical Review 81, 230-248. Suesse, T. and Liu, I. (2012). Modelling strategies for repeated multiple response data. Technical Report, MSOR 12-3 , Victoria University of Wellington. Suesse, T. and Liu, I. (2012). Mantel-Haenszel estimators of odds ratios for stratified dependent binomial data. Computational Statistics and Data Analysis 56, 2705-2717. Solomon, J., Jacobson, S. and Liu, I. (2012). Fishing for a solution: can collaborative resource management reduce poverty and support conservation? Environmental Conservation 39, 51-61. Liu, I. (2011). Analysis of Ordinal Categorical Data by AGRESTI, A. (Book Reviews). Australian and New Zealand Journal of Statistics 53, 124-126. Gunasekara, F., Carter, K., Liu, I., Richardson, K., and Blakely, T. (2011). The relationship between income and health using longitudinal data from New Zealand. Journal of Epidemiology and Community Health, online: doi:10.1136/jech.2010.125021. Suesse, T. and Liu, I. (2011). Modelling strategies for repeated multiple response data. Presented at the New Zealand Statistical Association 2011 Conference in Auckland, New Zealand, 29 - 31August. Matechou, E. Liu, I., Pledger, S., and Arnold, R. (2011). Biclustering models for ordinal data. Presented at the New Zealand Statistical Association 2011 Conference in Auckland, New Zealand, 29 - 31August. Liu, I. (2010). Marginal Models for Dependent, Clustered, and Longitudinal Categorical Data by BERGSMA, W., CROON, M., and HAGENAARS, J. A. (Book Reviews). Biometrics 66, 323-323. Mukherjee, B. and Liu, I.. (2009). A Note on Bias Due to Fitting Prospective Multivariate Generalized Liner Models to Categorical Outcomes Ignoring Retrospective Sampling Schemes. Journal of Multivariate Analysis, 100, 459-472. Liu, I.,, Mukherjee, B., Suesse, T., Sparrow, D., and Park, S. K. (2009). Graphical Diagnostics to Check Model Misspecification for the Proportional Odds Regression Model. Statistics in Medicine, 28, 412-429. Suesse, T. and Liu, I. (2008). Diagnostics for Multiple Response Data. The proceedings of PROBASTAT 2006 conference, Tatra Mountains Mathematical Publications, 39, 105-113. Mukherjee, B., Ahn, J., Liu, I., Rathouz, P, and Sanchez, B. (2008). Fitting stratified proportional odds models by amalgamating conditional likelihoods. Statistics in Medicine, 27, 4950-4971. Liu, I. and Mukherjee, B. (2008). Proportional Odds Models. Encyclopedia of Clinical Trials. (Editor: R. D'Agostino, L. Sullivan, and J. Massaro). Wiley: New York. Liu, I. and Suesse, T. (2008). The Analysis of Stratified Multiple Responses. Biometrical Journal, 50, 135-149. Liu, I., Suesse, T., and Mukherjee, B. (2007). Graphical Model-Checking Methods for Proportional Odds Models. The Proceedings of the International Statistical Institute 56th Session CD-ROM (828.pdf). Lisbon, Portugal. Mukherjee, B., Liu, I., and Sinha, S. (2007). Analysis of Matched Case-Control Data with Multiple Ordered Disease States: Possible Choices and Comparisons. Statistics in Medicine, 26, 3240-3257. Liu, I. and Wang, D. (2007). Diagnostics for Stratified Clinical Trials in Proportional Odds Models. Communications in Statistics : Theory and Method, 36, 211-220. Liu, I. and Mukherjee, B. (2005). Possible Ways of Analysis of Matched Case-Control Data with Multiple Ordered Disease States. The Proceedings of the 40th Annual Conference of the ORSNZ, (Wellington, New Zealand, December 2005), pp. 316-325. Liu, I. and Agresti, A. (2005). The Analysis of Ordered Categorical Data: An Overview and a Survey of Recent Developments. Test, 14, 1-73. Liu, I. (2005). Breslow-Day Test. Encyclopedia of Biostatistics 2nd ed. (Editors: P. Armitage and T. Colton). Wiley: London. Wang, D., Critchley, F. and Liu, I. (2004). Diagnostics Analysis and Perturbations in a Clustered Sampling Model. Communications in Statistics - Theory and Methods, 33, 2709-2721. Liu, I. (2003). Modeling and Describing Multiple Responses Given a Stratification Variable. The Proceedings of the 54th Session of the International Statistical Institute CD-ROM, Berlin, Germany. Liu, I. (2003). Describing Ordinal Odds Ratios for Stratified r x c Tables. Biometrical Journal, 45, 730-750. Hartzel, J., Liu, I. M. and Agresti, A. (2001). Describing Heterogeneous Effects in Stratified Ordinal Contingency Tables, with Application to Multi-Center Clinical Trials. Computational Statistics and Data Analysis, 35, 429-449. Agresti, A. and Liu, I. M. (2001). Strategies for Modeling a Categorical Variable Allowing Multiple Category Choices. Sociological Methods and Research, 29, 403-434. Agresti, A. and Liu, I. M. (1999). Modeling a Categorical Variable Allowing Arbitrarily Many Category Choices. Biometrics, 55, 936-943. Liu, I. M. (1998). Breslow-Day Test. Encyclopedia of Biostatistics (Editors: P. Armitage and T. Colton). Wiley: London. Liu, I. M. and Agresti, A. (1996). Mantel-Haenszel-Type Inference for Cumulative Odds Ratios with a Stratified Ordinal Response. Biometrics, 52, 1223-1234.